1 cup barley, be sure to check the cooking times. Quick cooking barley can be added to the soup for the appropriate amount of cooking time. My hulled barley takes 40-50 minutes so I cook it separately. Brown meat in hot olive oil in a Dutch oven for about 5 minutes turning often. Remove meat add chopped veggies and herbs top pot and sauté for 4 or so minutes (add garlic for last ½ minute of sautéing time). 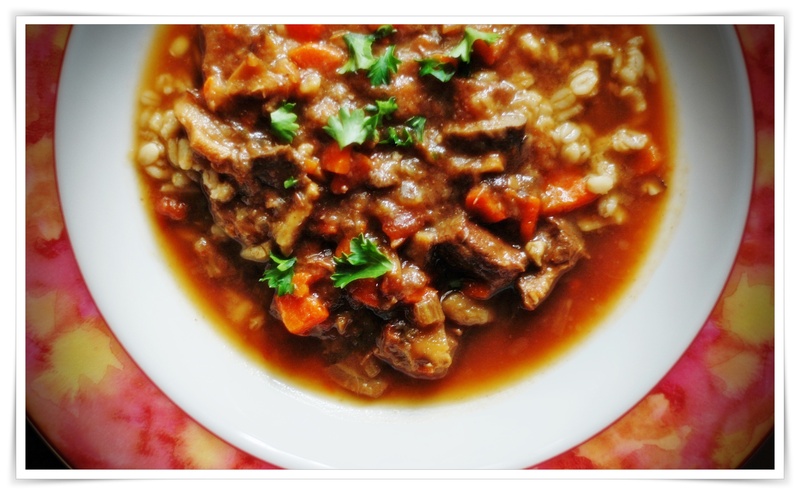 Deglaze pot with red wine return beef to pot along with the rest of the ingredients and simmer partially covered for at least an hour, test the beef for tenderness (1-1/2 to 2 hours) add the barley for the last 15 minutes or until barley is tender. I prefer to cook my barley separately in beef or vegetable broth according to package directions and then add to each bowl of soup.